Tollbar MAT Sixth Form College students and staff were joined by Reynolds Academy pupils as they took part in the annual Marine Conservation Society Beachwatch survey for the 10th year running. 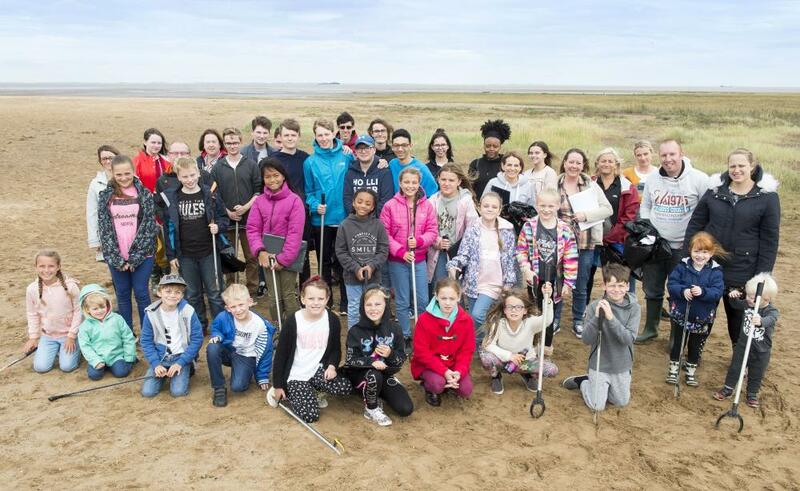 Students and younger pupils from Tollbar Multi Academy Trust came together to collect more than 50kg of litter along a 100m stretch of Cleethorpes Beach. The Year 12 Sixth Form College students have been taking part in the event every year for a decade, giving them an opportunity to make a contribution towards a piece of scientific research and gain valuable enrichment experience. They have been joined for the last few years by pupils from Reynolds Academy, as both are members of TMAT. This gives the older students the chance to mentor the younger ones and work together on a project which improves their local environment. Simon Grimshaw, Head of Year 12, said: "It has been 10 years since the College began taking part in this survey and and we always get a really good turnout. Plastics are a continuing issue on the beaches, and the aim is to record what we find and enter it into the survey to enable the Marine Conservation Society to continue its valuable work by building a continuing picture of the health of our shorelines." Tollbar MAT Sixth Form College students and staff are joined by Reynolds Academy pupils and staff - who are all members of Tollbar Multi Academy Trust - for the annual Beachwatch survey at Cleethorpes.